Susan Urban practices the Polish art of wycinanki ( paper cut design). She also makes cut paper dolls wearing costumes from different regions of Poland. Generations of West Springfield school children have benefited from having her as their art teacher. wycinankiare believed to have originated with Polish peasants. Farm women hung sheep skins over the window openings of their farmhouses as a way of keeping out the elements. In order to let in light and air, they used sheep shears to snip small openings in the skins. Like many folk arts, the practice was both functional and decorative. At some point, Polish women transferred their designs to paper. In Poland, wycinankivary by region. The women of Kurpie are famous for their paper cut-outs of animals, geometric designs, and flowers. These symmetrical designs are cut from a single piece of colored paper, folded a single time. Another style comes from the area of Lowicz and is distinguished by many layers of multi-colored paper. 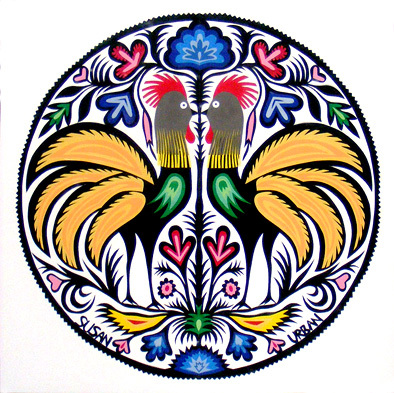 The native Polish rooster, which is black and noted for its strange-shaped tail feathers, is a popular subject for paper cutting wycinanki. Some designs with repeated elements are made by folding the paper and cutting through as many as eight layers at a time. Cutting paper designs can take anywhere from 25 to over 100 hours.